With its sweeping 2,330-km-wide viewing swath, MODIS sees every point on our world every 1-2 days in 36 discrete spectral bands. 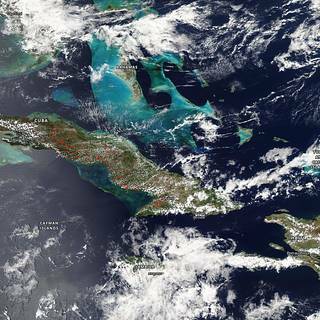 Consequently, MODIS tracks a wider array of the earth’s vital signs than any other Terra sensor. For instance, the sensor measures the percent of the planet’s surface that is covered by clouds almost every day. This wide spatial coverage enables MODIS, together with MISR and CERES, to help scientists determine the impact of clouds and aerosols on the Earth’s energy budget. In addition to recording the frequency and distribution of cloud cover, MODIS measures the properties of clouds such as the distribution and size of cloud droplets in both liquid water and ice clouds. 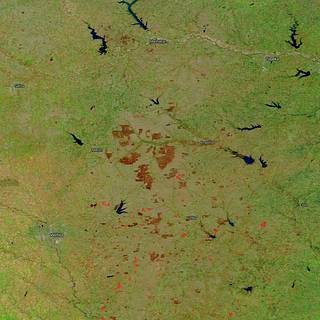 MODIS also measures the properties of aerosols—tiny liquid or solid particles in the atmosphere. Aerosols enter the atmosphere from manmade sources like pollution and biomass burning and natural sources like dust storms, volcanic eruptions, and forest fires. MODIS helps scientists determine the amount of water vapor in a column of the atmosphere and the vertical distribution of temperature and water vapor—measurements crucial to understanding Earth’s climate system. MODIS is ideal for monitoring large-scale changes in the biosphere that are yielding new insights into the workings of the global carbon cycle. MODIS measures the photosynthetic activity of land and marine plants (phytoplankton) to yield better estimates of how much of the greenhouse gas is being absorbed and used in plant productivity. Coupled with the sensor’s surface temperature measurements, MODIS’ measurements of the biosphere are helping scientists track the sources and sinks of carbon dioxide in response to climate changes. Almost every day over the entire globe, the sensor monitors changes on the land surface, thereby building upon and extending the heritage begun by Landsat. MODIS maps the areal extent of snow and ice brought by winter storms and frigid temperatures. The sensor observes the “green wave” that sweeps across continents as winter gives way to spring and vegetation blooms in response. It sees where and when disasters strike—such as volcanic eruptions, floods, severe storms, droughts, and wildfires—and will hopefully help people get out of harm’s way. 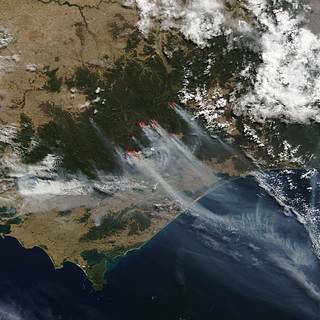 MODIS’ bands are particularly sensitive to fires; they can distinguish flaming from smoldering burns and provide better estimates of the amounts of aerosols and gases fires release into the atmosphere. MODIS sees changes in the Pacific phytoplankton populations that may signal the onset of the famous El Niño/La Niña climatic siblings well ahead of their arrival. In turn, by coupling its sea surface temperature and ocean color measurements, MODIS has observed the impacts El Niño and La Niña have on the microscopic marine plant. MODIS also has a unique channel for measuring chlorophyll fluorescence. All plants bombarded with light begin to glow, or fluoresce, but in wavelengths that our eyes cannot see. The more plants fluoresce, the less energy they are using for photosynthesis. Thus, MODIS not only maps the distribution of phytoplankton, it also helps us gauge its health. Another MODIS instrument flies aboard Terra’s sister ship—Aqua.